The Chinese, Mongolians, and Tibetans have used goji berries for millennia as a herbal medication. Now, it’s your turn with our very own and truly special Goji Berry Tea. These fascinating red berries are considered a ‘superfood’, offering a wealth of vitamins, minerals, and other antioxidants. In particular, our Goji Berry Tea contains Vitamins A, B2, and C, as well as iron, selenium, and polysaccharides. Combined, these components pack a healthy punch. But what if you’re looking for great taste and great taste alone? With this in mind, it’s important to note that Goji Berry Tea boasts a bold fruity flavour combined with malty undertones brought out from the addition of only the finest quality Chinese Black Tea. 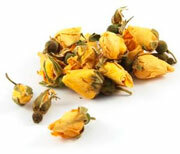 As well as this, other ingredients include orange peel, carrot flakes, yellow rosebuds, and safflower petals. Embrace the spirit of the mountains; the home of this wonderful berry; with Goji Berry Tea. 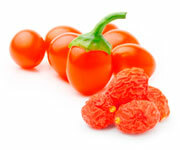 Goji Berries come from two closely related plants called Lycium barbarum and Lycium chinense. Both of these plants belong to the boxthorn species of the nightshade family, Solanaceae. The Lycium barbarum plant and the berries it grows are known by many names such as wolfberry, Chinese boxthorn, Himalayan goji, Tibetan goji, mede berry, barbary matrimony vine, Duke of Argyll’s tea tree, Duke of Argyll's tea plant, Murali (specifically in India), red medlar, and matrimony vine. 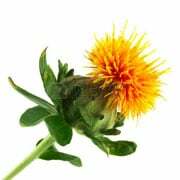 The fruits of both the Lycium barbarum plant and the Lycium chinense plant, as well as their respective healing properties, have been well-known in China for literally thousands of years. In Traditional Chinese Medicine (TCM), goji berries were, and still are closely associated with improved kidney and liver health. Meanwhile, one publication titled “Tractate for Herbs and their Properties” recognised that goji berries could restore the depots of body liquids, revitalises the skin, and strengthens the vision. In another Chinese classic book, “Herbs and food healing”, it is written that goji berries strengthen the muscles and tendons, protects from illness and, believe it or not, can lead to long-living. One of the most famous healers in Chinese history, Li Shudjun, in his 1578 publication, “Foundations of Pharmacopeia”, stated that the people from the village Nanchu once ate Goji fruits and almost all of them were centenarians. We can’t guarantee you’ll live into your hundreds, but we can certainly say that once you’ve tried Goji Berry Tea you’ll never look back! Type of Tea: Flvoured Black Tea. Ingredients: Black Tea, freeze-dried whole Goji berries, Orange peel, natural flavouring, Carrot flakes, Yellow Rosebuds, and Safflower petals. How to Serve: Lemon or honey may be considered, although this tea is best served as it is. Tasting Notes: This palate-pleasing infusion boasts sweet, fruity notes with a smooth, malty finish. Health Benefits: In the past, women would drink Goji Berry Tea to look younger and more beautiful. Chinese men, on the other hand, also used Goji to strengthen their sexual vitality. Today, however, most prefer to consume this beverage owing to discoveries made through modern science. One small study from 2008 found a daily drink of 120ml of goji berry juice for 14 days improved feelings of wellbeing, brain activity, and digestion. While this research did not specifically use Goji Berry Tea, the health benefits are likely near-identical. Furthermore, Goji Berries and Goji Berry Tea are thought to naturally treat diabetes and can even promote healthier skin.